These holsters are in stock and are guaranteed to ship within 3 business days of ordering. While not offering the customization options that a Custom CAS/C5S IWB Holster offers, for our customers who aren’t picky and want their holster fast this is a great option. We stock holsters for the most popular firearms from Glock, HK, Ruger, Smith and Wesson and many others. Don’t see your firearm listed? Chances are, we still make holsters for it – visit our custom CAS/C5S IWB Page. XDS 9/40 3.3"XDS 9/40 4.0"
I took the gamble and ordered this for my glock 43 without any reviews. I ordered the model with the forward cant because I carry while driving and am too big for appendix carry. I have 3 different carry guns with IWB holsters for all of them, each one from top rated American manufacturers. This holster blows them all out of the water, the fit and finish is amazing. I own about 6 holsters from competitors all the dual clip style with Kydex and either a leather or synthetic backer because I found them to be the most comfortable. Once I tried this one on it was better than anything else. The curve built in contours my hip perfectly without the added bulk of a oversized backing material. It is balanced so good you can actually set it on a table on the barrell end and it balances perfectly with the loaded gun and extra mag in posistion. It retains the gun and mag with just the rite amount of resistance and clears my Big Dot sights with out issue. The best thing is nothing digs into you in any normal range of movement even while driving. It looks like they heat all the edges of the Kydex giving it that rounded glazed plastic feel that is smooth as silk. After spending hundreds with Cross B and Alien G (these are at least good products) and buying a Urban C ( this thing is useless avoid at all cost despite reviews) I finally found what works best for me. I’ve been using this holster for several months now and have ran it extremely hard in 3 classes including a week long PSD class. The holster is very durable and the build quality is great. However, in my opinion-it needs two clips instead of one…I’ve found that the holster will move around on you while bending/kneeling, etc throughout the day. 2 clips are the standard for most every successful dual holster/carrier for a reason; They balance the load of the mag/gun and are still extremely quick to put on and take off with the FOMI clips. Another option that would be well received by other guys and gals who carry appendix is the addition of a claw at the bottom that pushes against the belt… It serves two purposes. Number one, it helps conceal the gun at a more natural angle. Number two, it makes drawing the gun from the appendix position much faster and more fluid as it presents it at an optimum angle. The holster is well contoured against the natural body shape. This helps conceal it but does hinder/slow down the draw time. Adding a raptor type claw that can be removed if not wanted and a second clip would make this a truly 5 star holster. The build quality, price and shipping time are already there and are honestly unmatched. A gen two version would bring it over the top… Keep up the great work Gunfightersinc. Large holster disappears on hip, refreshingly thin and contours make comfortable to wear, truly unique animal. Single clip wide enough and keeps stable in most situations. Pistol clears fast and retains well. Hard to believe this is also a paddle and not a belt holster! Highly recommended! Thank you for making a quality holster. The fit was a little uncomfortable but that was not because of the holster or the craftsmanship. This holster is well built using quality kydex. Thanks gunfightersinc. The current market trends show an overwhelming push towards lightweight, highly concealable single stack pistols. These pistols are easy to carry and with the right holster, are barely noticeable under a wide array of cover garments. The major trade-off with a single stack 9mm is capacity. Even with a +1 or +2 baseplate, you are still sitting at half the round count of a double stack pistol such as a Glock 19. While it is certainly an option to carry magazines in pockets or in a separate pouch, we wanted to offer a system that would allow you to have a spare magazine at the ready in a streamlined low-profile system. 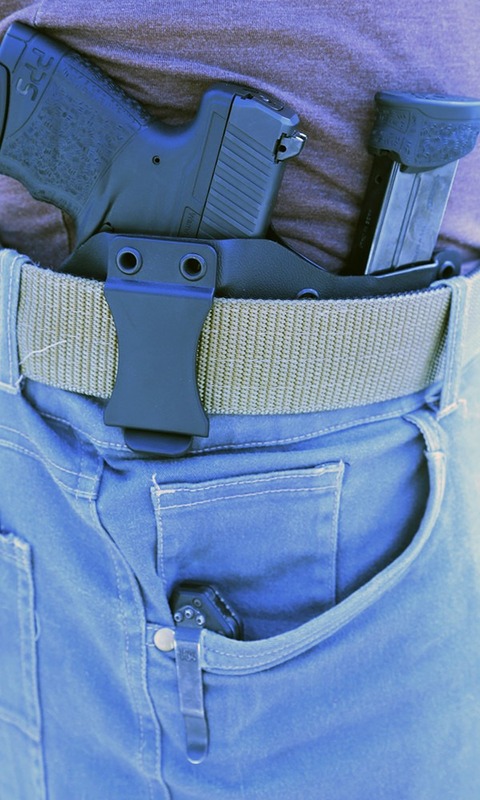 Thus the CAS IWB Holster – which stands for Covert Appendix System. Also available in the C5S variant for strongside carry. We designed the CAS IWB Holster to carry your firearm vertically for easy concealment and comfort when the firearm is located in the appendix position and your magazine at 30° angle for the fastest and most natural draw possible. The rounds are set to face toward the firearm to enhance quick reloads. We hand contour the holster to have a steep curve that pulls the firearm and magazine into the body to reduce printing and aid concealment.